This Book of Memories memorial website is designed to be a permanent tribute paying tribute to the life and memory of Mona Morris. It allows family and friends a place to re-visit, interact with each other, share and enhance this tribute for future generations. We are both pleased and proud to provide the Book of Memories to the families of our community. 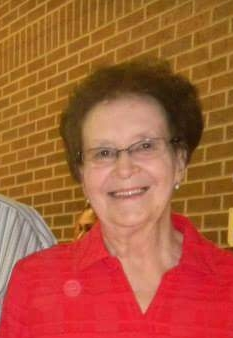 Mona Ruth Morris, age 83, of Johnson, Kansas, died Thursday, August 16, 2018, at Via Christi Hospital St. Francis in Wichita, Kansas. She was born October 24, 1934, in Ford, Kansas, the daughter of Leroy Dee “Roy” and Nellie Ruth (Padget) Snook. Mona lived at Ford and Dodge City until moving to Johnson when she was a Junior. She graduated from Johnson High School. She worked at Johnson State Bank and in the Stanton County Treasurer’s Office. Mona was the office manager for Greeley Natural Gas Company, retiring after 23 years of service. She was a member of the Order of Eastern Star and a Past Grand Matron. She enjoyed playing bridge, going to Las Vegas, Monument Lake, horse racing and rodeos. However; the most important thing to her, was being a wife, mom, and grandma. Mona married Mearl Morris on December 22, 1951, in Clayton, New Mexico. He survives. Other survivors include her son, Jerry Lee Morris and wife Rhonda of Johnson; brother, Duane Jay Snook of Johnson; grandson, Cody Lee Morris of Johnson; and two great-grandchildren, Jerin and Brendon Morris, and their mother, Kristy Morris of Johnson. She is preceded in death by her father, Roy Snook; mother and step-father, Nellie and Walter Winger; and brother, Royce Snook. Funeral service will be held at 10:00 AM on Tuesday, August 21, 2018, at the First United Methodist Church in Johnson, Kansas with Reverend Richard Fitzgerald and Pastor Mary Courtney officiating. Interment will follow at the Stanton County Cemetery in Johnson, Kansas. Friends may call from 2:00 PM until 8:00 PM on Monday, August 20, 2018, at Garnand Funeral Home in Johnson. Memorial contributions may be given to Children’s Miracle Network at St. Francis Hospital, Wichita, Kansas, in care of Garnand Funeral Home, PO Box 715, Johnson, Kansas 67855.